Do Snowy Owls hunt during the day or at night? As they are normally arctic birds, Snowy Owls are adapted to hunt both during the long hours of summer and the near-total night of winter. During the winter, these birds can sometimes be found as far south as the northern United States, where they hunt most actively after dusk. Snowies are opportunistic eaters, and will consume rodents, rabbits, and even ducks and other birds. This April BirdNote listeners are going on a spring migration adventure in the Texas Hill Country — and you can join us! Trip details and more at Birdnote.org. 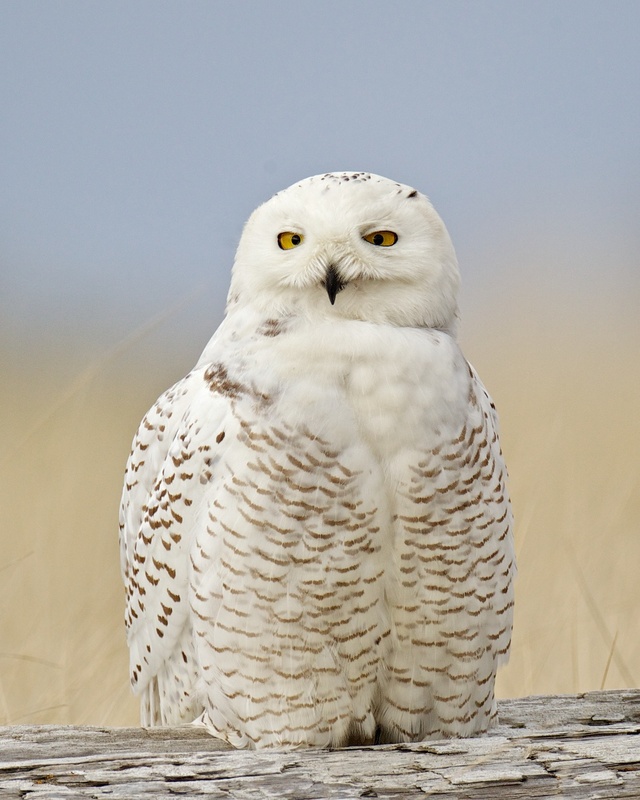 Snowy Owls: Day Birds or Night Birds? Snowy Owls are glamour birds. When some fly south from the Arctic, to adorn fence posts and driftwood logs in the northern United States, people turn up in flocks to see them. But these owls are infrequent visitors to the Lower 48, even in winter. Most Snowy Owls stay in the Arctic all year long, hunting through both the long hours of summer and the darkness of winter. So what time of day do Snowy Owls hunt when they come south? Are they diurnal, or daytime hunters, or nocturnal ones? Where the big owls winter farther south, many hunt from dusk into night. During the day, they often stand on the same perch, snoozing on and off. But around sunset, the white feathered hunters begin to appear restless, fluffing their feathers and gliding from perch to perch. As dusk sets in, these opportunists fly out to seek their prey — rodents and rabbits in fields, and ducks and shorebirds along the coasts. They will even fly out over the water to take sleeping seabirds. Have you seen a Snowy Owl in your neck of the woods? Share a photo on our Facebook page, at Bird Note Radio. Relax and escape into glorious birdsong. Receive an exclusive twenty minute version of Gordon Hempton’s “Global Sunrise” at BirdNote.org. Bird sounds provided by The Macaulay Library of Natural Sounds at the Cornell Lab of Ornithology, Ithaca, New York. Recorded by Gerrit Vyn, Philip S. Taylor, and William W. H. Gunn.